For the millionth time, just because I don’t want kids doesn’t mean I don’t like kids or don’t support my friends having kids. I have three amazing and perfect godchildren and I’m a children’s author – I need kids! Still, when my besties started having babies I can’t say I wasn’t worried about things changing – I knew that they would. I’m genuinely excited and nervous about our new roles and how I will fit in. I want to be a loving “auntie” and hope that my childlessness isn’t a cause for concern. While I’m trying to be a good prenatal buddy, I’m just not sure if I doing it right. Do I ask too many questions about pregnancy? Not enough? Am I offering too much help? Not enough? Is it bad if I still want to talk about reality shows instead of strollers? I’m afraid that I can’t still be myself and admit that I’m little jealous of junior. But my biggest fear of all is: What if the babies don’t like me? My solution? Buy the best baby gift! At WNK we promote an environmental agenda and prefer when people decide to have children they consider their carbon footprint by having green babies. In the past I’ve mentioned buying cloth diapers for my favorite green mama. And I just bought a personal website for a Christening gift. Unusual? Yes. Green? Absolutely! For other green ideas check out environmentally friendly baby products from celebrity eco-parents like Jessica Alba and Soleil Moon Frye: Green gifts. Of course nothing says you care like a signed book by your favorite kid’s author. Hey WNKs what is your favorite baby gift? Shake your Babymaker – Virtual Babies! Okay I’ll admit it I don’t want kids, but I still have imaginary baby names in my head and I’m curious about what my baby would look like. Just not curious enough to find out for real. 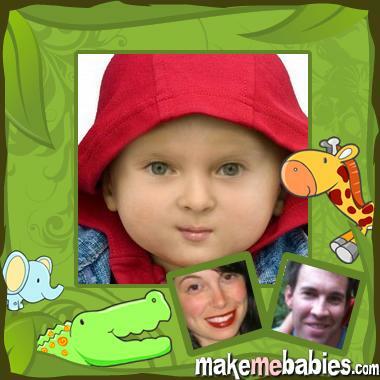 For the other childfree and curious there is a place for us, or rather several websites that will take pictures of you and your significant other and mix the virtual, visual DNA to create, TA-DA – a baby! Have a lust for someone? Eager to see what your baby will look like? No need to wait nine months to see your baby’s face — BabyMaker will accurately produce a picture of your baby. Satisfy your curiosity and peek into the future! There are even baby maker apps and celebrity baby maker sites in case you want to see what your baby would look like if Ashton Kutcher is the baby daddy. I hear he’s available! It is very entertaining if you want to laugh some milk right out of your nose. Amazingly my baby looks just like the baby on the ad and nothing like me or my mate. Baby G even has blue eyes and blond hair which is genetically impossible! This is kind of addictive and I can totally see why the Duggar family is eagerly expecting their 20th real child. It’s fun to make babies! But I will stick to virtual kids. For those of you that saw our previous FB post of childfree Chelsea Handler and asked for more, we borrowed this one from Alvaro and our friends on “Happily Childfree“. What do you think? Do you have examples of other women doing this kind of comedy? I’m not sure if the interview occurred before or after the Laugh Factory routine. And “Garfunkel & Oates” are cute. Who knew? They can carry a tune and smile and condescend at the same time. And while their song is topical in a way that kinda fits them on our page, I am already making apologies, starting with my friend Sarah, who is not smug at all lately. Thanks to Rochelle for posting this on Happily Childfree. CLICK HERE FOR VIDEO of Amy Poehler’s Tip For Traveling With Children. SNL alum and Parks and Recreation star Amy Poehler has an effective strategy for traveling with babies. DRINK! This one is from a direct post to our “Why no Kids?” Facebook page, where you can find more compelling clips and stories that have not (yet) appeared in the Blog. Poehler’s P&R co-star Asiz Ansari also chimed in about his own baby strategies earlier this week. And check WNK archives for comedy clips and print from the likes of Louis C.K., Jason Jones and Drew Magary. And if you want to keep laughing or prefer conversation staring comedy from daddies, have a look at Louis C.k. and Drew Magary on WNK here.